According to the Census Bureau, total spending on private residential construction projects increased 0.8% during December. The initial estimate for November was revised measurably lower from an increase of 2% down to an outright decline of 0.3% (due primarily to a sizable downward revision to home improvement spending), while the reported growth rate for October was bumped up to 2.8%. 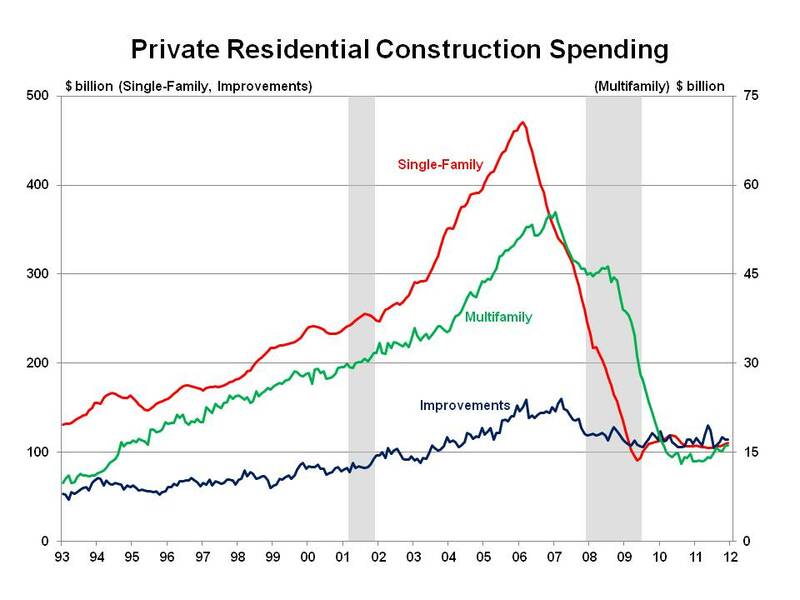 Overall, private residential construction activity was on a modest upward trend during the second half of 2011 as spending increased in four of the final five months of the year. On a year-over-year basis spending rose 4.9%–the largest percentage gain since June 2010. For the calendar year as a whole, spending reportedly fell 1.1% versus 2010, which marks the smallest rate of decline in construction spending for a calendar year since the housing market downturn began. The new single-family housing category trended higher during the second half of 2011, registering seven consecutive month-to-month increases. The overall magnitude of growth has been modest as spending has climbed 3.7% on a year-over-year basis. This improvement, modest though it might be, does match what has been observed with other indicators for the single-family housing market, including an increase in new construction starts and rising homebuilder sentiment. Additional growth in single-family construction activity is expected going forward, but the pace of growth will remain moderate due to still-sluggish job growth, tight mortgage lending standards and competition from sales of distressed properties. Spending on new multifamily housing slipped for the third time in four months, but overall this segment has experienced an appreciably stronger level of improvement over the past year. In fact, spending on new apartments and other multifamily projects increased nearly 19% on a year-over-year basis in December. The current level of permits multifamily permits (above 200,000 annualized units) points to more healthy increases in spending on new multifamily construction projects for at least the next year. Home improvement ticked higher during December and gained 4.4% compared to December 2010. For the full calendar year, spending on remodeling activity increased 2.8%. A combination of tax credits providing incentives for existing homeowners to install energy efficiency upgrades and buyers repairing recently-purchased distressed properties have buoyed home improvement spending. NAHB’s latest release of the Remodeling Market Index (RMI) indicated that home remodelers have seen an increase in calls for job bids and appointments for job proposals, both of which suggest stronger future demand for home improvement.